This is the unofficial Harley Quinn fan page where we will feature the latest news on everyone’s favorite Gotham City’s villainess. 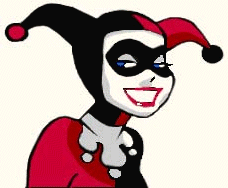 Now is a great time to pick up a Harley Quinn outfit so currently we will be discussing the various Harley Quinn clothing available on the internet. Please be aware that we do not carry any products or sell anything here. We only offer information and links to third party companies that sell the items if you are interested so read their website and store policies if you decide to order anything and contact them if you have any problems. We will try to keep all news up to date and let you know if we discover any special deals on the market. In the meantime, have fun! APE2012 on October 13 and 14th in San Francisco, CA!